Notepad Chaos template for free download on Blogger Templates. This template is fully compatible with any shared web hosting. Ok, I uploaded the template and it looks nice but there seem to be some problems…like my friends and links tab is barely visible and hence, not usable. What do I need to do? Hey Sharmistha! Mine is doing the same thing. i have the same problem with the friends link. also would love to add things to my sidebar and edit colors of my posts but the editing page in blogger is almost impossible to read. any suggestions or tips to make this template a little friendlier? Thanks Holly for the tip! I just discovered that if you add a lot of “links”, the “Friends & Links” gif will appear to ‘move’. What’s happening is the “padding-top” isn’t large enough to accommodate a large link list, nor is it dynamic enough to automatically adjust as you add links to your site. Easiest way to fix that is to follow the same directions above, but instead of making the padding-top be 70px, you’ll need to experiment by increasing this number and seeing what works for you. Click the preview button to check out your work and see if it formats correctly for you. I had to actually increase mine to 225px. But it works great! I really love this template for it’s uniqueness. How do you make the drop-down post-it tabs actually take the reader somewhere (About, Archives)? I’ve found the place in the HTML where a URL seems to show where it’s supposed to go. (So sorry to ask a retarded question… Am very new to XML/HTML and blogging!) Do I just edit this to the URL I want it to be? can anyone tell why Friends&Links does not work? I mean, I did all the job mentioned above, but still not works.. Yes, please could someone tell me how to change the post its in the right hand corner (home, about, archive) so that the correct links are there?? how can we edit the about & archive links so that it would direct the user to the correct page and links? What do I do with this undefined tab on the left hand side of the template? It’s beautiful. and I still don’t know how to make the links actually link to something. I’m a day into this! Oh and how do you edit to change the fonts? Do I need to take a class? how can we customize the category list? blogster doesnt use the pages other than home…how do i do use them? hi i am trying to unzip this file but i cant seem to find it i hav looked everywhere could u plz tell me how to unzip this file i would really appreciate it. All day long the screen is just showing up green with my text and photos, etc, but not with the rest of the template. All the nice things. Can you tell me what is happening? Couldn’t get the date to work even though I followed the instructions above. I’ve got the same problem at Nora Ibsen. Hi Nicole, have you tried this yet? I cannot get the usual Blogger stuff to be at the top, like the dashboard, when I use one of these templates… anyone know how to fix this? Thanks! This template was converted from wordpress to blogger. I am afraid you have to go to blogger dashboard to add or edit posts. Sorry about that. Sorry, I am html/xml dumb, but does that mean I can’t use one of these templates if I want all of that stuff at the top? i cant seem to be able to downlaod the templatee, got any tips? Hi got it downloaded, but cant log in to fix any of it. Theres no login tab?? How do I fix that? Are you referring to logging in to blogger dashboard? You need to access blogger site to do that. Search through the HTML code until you find the following. Then insert the page addresses into the fields as I’ve indicated below with the words ADDRESS TO YOUR PAGE HERE. That’s it. Thank you everyone for all your help with this layout!! Hopefully this helps someone in return. darn it. forget it. I tried. Back to the “Friends and Links” part. I followed the directions stated above to align the header and the list but now I have way too much blank space between this item and the one above (I believe it is the categories section). I have no clue about HTML but have been following the directions given this far just fine. Thanks for the help. How do we get the About and Archives links to work? where’s the code? n wt r the steps? I have one more issue, I want to add a socialfeed under EACH post. hi swank, i tried pasting the codes but nothing showed up. please advise, thanks! hi swank, i tried with ‘coffee desk’ template and same thing happened, as in there seems to be some error. when i preview after pasting the codes, it showed a blank page. CoffeeDesk template is currently not available due to it not working on the latest browsers. 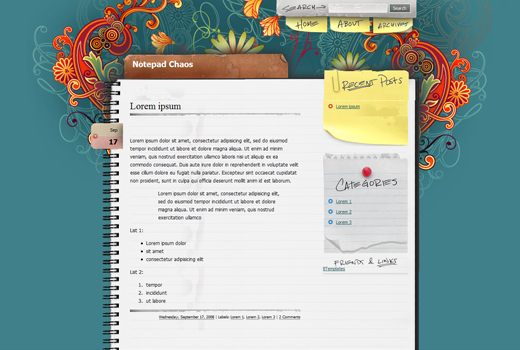 As for Notepad Chaos template. After you downloaded it you need to unzip it then you will find NotepadChaos.xml inside it. You need to upload this file by going to your blogger dashboard -> Layout -> Edit HTML and upload from there then save. It should work. hi swank, thanks for the prompt response. yes i did unzip and got the codes. after pasting it into blogger, it does not work in the preview. i’ve changed the blog skin many times, but not sure why this does not work. Did you upload the whole file by the text box field uploader or did you open and copy paste the codes into the code box? i cannot open the xml doc in browser, hence opened in wordpad and copied the codes into blogger. there is no uploader option, i go ‘Template’, under ‘Edit HTML’ and paste the codes. is there another way to update the codes? Hmm strange, Under Edit HTML page you dont see a text url box that ask you to browse for your file at all? hi swank, i got it! it’s the settings problem. Oh, mind letting us know what settings problem it was? Thanks! i switched to the classic style, hence the uploader and other new features were not present. Oh no wonder, haha ok problem resolved. well, after a lot of searching the comments I have figured out how to fix the friends link thing and also the undefined tab…however there is nothing in the comments teaching how to get the tabs of home/about/archives to function appropriately…please help! If I add any jump break to any post the read more option is not showing up in the main page. Can anyone please help me how to solve this problem? How do you change the “undefined” tabs at the sides of each post? Or is it possible to remove them in blogger? Cannot open file: it does not appear to be a valid file archive. If you downloaded this file, try downloading it again. I’ve attempted this about 5 times…suggestions? Nutmeg, I tried downloading it and unzipping it, it works for me. Perhaps your winzip is corrupted? Or you can try winrar or 7zip. I downloaded it but I can’t get it to work! It says :”Your template could not be parsed as it is not well-formed. Please make sure all XML elements are closed properly. About/Archives/Search box Does Not Work. Please help!! Any advice is appreciated. Is there any way to change the button on top to say something other than “archives” ?? and there you can find the place to replace the URL to the page you want. Yes Jessica, do the above I mentioned and you can change the URL, but to change the words you need to create the word image in photoshop as this is in an image form. how would I get that image (the “archives” button) into photo shop to change it? A screen shot? disregard above — I was able to edit it in photoshop with some work — how do I get the new menu image into the template now though? You would need to upload it to a free image hosting website, google one for it but most image hosting websites will delete the image once every few months so you would need to reupload again. All default template images however are stored on our servers for lifetime. After you have uploaded the image, copy the URL of the image and go to your blogger dashboard -> Design -> Edit HTML and do a CTRL + F search for archives word and there you will see the image URL of the current one, change that to your new image URL and your set to go. Thank you for such a beautiful theme. I downloaded it yesterday and have fixed the date problem and problem with the friends/links section being cut off (based on your advice in these comments), thank you! I can’t get the recent posts section to work though – have made a couple of posts and it’s still empty – please could you give me some advice on how to fix it? Have you tried replacing the recent post with a gadget on Design tab? So I’m not sure how to get that to work to show the recent posts or even how to replace it (because i’m not sure how to remove it). Hmm, it should work actually because it worked on the demo. Can you post your website URL under the website field when you reply in the comments, dont put it in the comments cos the reply wont get approved. I had set my blog settings so that only people i invite can view my blog…i went to change it to public, so that you could have a look and then all the recent posts showed, when i changed it back to private it stopped working. Any advice on how i can get it to work when only invited readers can view my blog? I manage to solve the friends & links problem though it took a lot of time to fix it…Could somebody answered the archive button issue? How can we create a page link to blogger archive ?? How can it connect with “Blog Archive” default in blogger? My “Recent Post” and “categories” is also not working..nobody answered for this question so far too..anybody can help??? i cant make the about and archive links work. everytime i change it, the links dissapear. does anybody can help me here?? I really want to use this beautiful template! But why NOBODY really answered our questions???? And Dear Gucci, how do u make your “Recent Post” links work??? Can you share? i downloaded your awesome template for our school assignment to make it pwn and pwn good. i have a question about your friends and links section though. how exactly does it work? i mean, what do i do to it? how do i add the friends and links? i hope you reply soon. Try going to your Gadgets area and edit the gadget to add links of your friends. I have read all the great advice. Tried most of it, but still can’t get the home, archives, about tabs to work. Help please!! I’m having trouble adding this template to my blog. How do I go about doing that? i clicked on installation/Settings and it doesn’t provide instructions. When I link the About Me section to my blogger profile it says it’s not available. I have given complete access to it in my settings and I can access the profile via the link if I paste it into my browser, but not via the about me tab. I even tried pasting it in the home page tab and the same thing happens. Any idea what I’m doing wrong?? Thanks to your advice, I managed to get the ‘Friends and Links’ section and the date working. However, I still can’t figure out how to link the ‘About’ and ‘Archives’ tabs. I’ve read through all the comments, but I can’t find the url to replace in the code. There’s one url there that I can find, but it’s a .jpg and replacing it does nothing. Please help? The word “friend” under Friends and Links is spelled wrong. Can that be fixed? Also, how do I add a link there? When I go to the design area, there is no gadget to edit to add a link. When I added a new link gadget hoping it would connect, it shows with a note of (misc debris) next to it. Thank you for the template, I really love it now! The explanation given to others does help me to understand the downloading steps for your template code! Cool! But one thing, the pages divider… how could i make it link to the month’s written? Do I need to link/edit it via html code as well? Please advice, appreciate that! hi, i uber like this template, how do i download this… sorry, i’m new to blogging. thanks much! There is a download button that is red in color on this page right at the top below the template image. Do you see it? Ive read through the comments again and again trying to fix the links to “home/about/archives”. I cant figure it out. Can you please show me EXACTLY what to change in the HTML? Gees this form changes my text in to real html. I’ll try it again, but I have to change some of the code now. Let’s see if this will work. Where it says a href=’/’ rel=”nofollow” you can put in your link, between the ‘ and the /’. The home-tab already is linked to you homepage though. Hi, I am still figuring out on how to set Archive link to blogger. What link should I set to that button? Pls advise thanks a lot. hi there! how do you make the share buttons (with +1) appear? i’ve already ticked the ‘share’ box but they still don’t appear on my site. appreciate any tip/s you can give! Thanks! or could you give me the HTML? TNX! because I’m just new to it,we’re just ask by our teacher to make our own blog.. So, I like the template and would like to use it. If possible, I would appreciate addition info on how to proceed. Thank you. I read through all of the comments (that took me a while) but still was not able to solve my problem so can anyone help me out with this? Where on the HTML code do I go in order to change the “About” tab link to a specific URL that I want to set? Also under the “Friends & Links” section… where on the HTML code do I go and add links, buttons, sites, etc. Where and what do I type in? I would like to post buttons to sites such as the twitter button and other site buttons. I would greatly appreciate the help. Wow, incredible weblog format! How lengthy have you ever been blogging for? you make running a blog look easy. The entire glance of your site is fantastic, as neatly as the content! Ok…I’ve spent the best part of the night trying to figure out how to make the ‘about’ button under the search box work. I’m just exhausted and giving up. Guessing that perhaps I’m just not computer savvy enough to read and implement. I’m still going to give this template a run as I find it to be a really cool looking one. I’ll just have to see what I can learn from this point forward! Thanks for the cool looking template….bugs and all!